The Ultimate running shoe. Supreme comfort and stability come as standard with the new Kayano 23 which is a shoe made for those that want the best. Discrete Eyelet – Improves upper fit while reduces possible irritation. 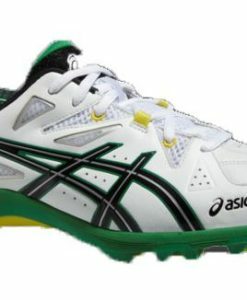 The perfect cricket shoe, the Asics Gel Kayano 23 Running shoe is a combination of balance and comfort. It uses the Impact Guidance System for enhanced foot gait and Gel cushioning system for rear and fore foot shock absorption and allowing smooth movement of foot in all directions. The Full Length Guidance Line is a vertical flex groove that improves gait by decoupling the tooling along the line of progression. It has ample cushioning provided by the Double Density Solyte midsole. Along with these features, it also showcases the Dynamic DuoMax Support System, the Guidance Trusstic System, Counter Clutch, the Biomorphic Fit Upper and Discrete Eyelets for a superior playing experience. VKS makes this coveted shoe easily accessible, delivered right at your door.